Searching for the perfect Dematting Tool for your furry friend, but do not feel like spending time choosing the best variant? You don't have to, we have done it for you! Easily eliminate all that extra pet hair around your house,and more time playing with your furry friend. You'll love your pet's silky, smooth coat, and reduced shedding. The rounded and smooth edge of our stainless steel blades means no skin irritation Wood is Not Only Beautiful and Durable, It is Also Renewable and Biodegradable. The handcrafted wooden handle is designed to comfortably fit your hand. Eliminate Hair in Minutes：All it takes is a few short, quick strokes of the rake over your pet's undercoat. The stainless steel teeth easily remove loose, shedding fur from even the thickest undercoats without painfully pulling or damaging sensitive dog or cat skin. For dogs with longer coats, separate fur to reach the undercoat. Avoid sensitive areas such as ears and belly and do not use on pets with thin hair. An Inexpensive Way to Keep Your Pet Looking and Feeling Great. This undercoat rake with its sleek wooden handle is a professional groomer's best-kept secret. If you have a dog or cat that sheds a lot, it's important to groom their coats several times a week-but do not shave them. Shaving your pet's undercoat will reduce their ability to regulate their own body temperature. That's where the undercoat rake comes in. You'll eliminate excess fur-without stripping or ruining your pet's beautiful coat. Instead of waiting until your pet's fur becomes so tangled or matted you have to get professional help, you can use Popular Sky Rake to easily detangle. GIVE BACK TO THE COMMUNITY when you buy pet undercoat rake donate a portion of all our profits to animal charities, no-kill shelters, and animal rescues so you can give back to your furry friends and their communities。At the same time, we also invite more people to love small animals and make people get along well with animals. BEAUTIFUL AND SHINY COAT: The pet brush will not only save you from the mess of shedding hair, it will make your pet's fur look shiny and beautiful. suitable for Husky, Border Collie, German-shepherd, Labrador. CLEAR ALL DIFFERENT MATS AND TANGLES：Our pet grooming tool not only works great as a dematting brush or detangling comb, you can also use it as an undercoat comb or deshedding rake. 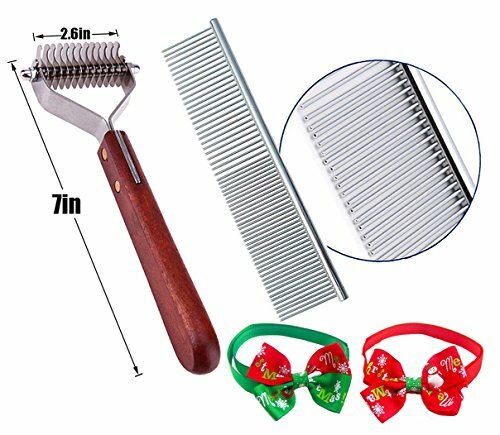 This cat and dog comb can cut a matt or tangle then be used as a deshedding brush or deshedding comb. It's the ideal gift for a furry friend or a great addition to any pet grooming kit. NON IRRITATING AND VERY GENTLE: The undercoat rake will never hurt or irritate your pet's skin. The dematting comb has rounded blade edges for a gentle touch that will feel like massaging to your dog. Try to dig in and use a little muscle, it won't harm your pet but release more waste hair. BUY NOW WITH CONFIDENCE ： Unconditional Satisfaction Guarantee - ABSOLUTELY NO RISK TO YOU! We offer a REPLACEMENT PET BRUSH or REFUND if for any reason you are unhappy with your purchase! If you have any questions about this product by Popular Sky, contact us by completing and submitting the form below. If you are looking for a specif part number, please include it with your message.